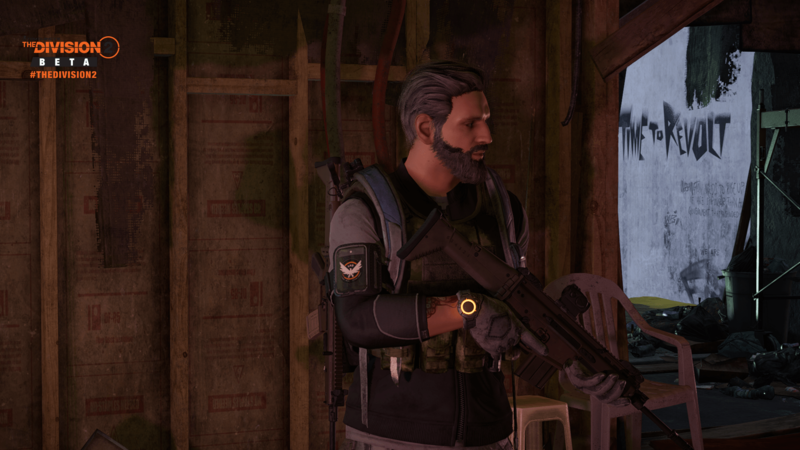 I may have used a Daft Punk song for the title of this article, but I could not think of a better fit to describe my time with Tom Clancy’s The Division 2 private beta. Overall, it is a wonderful upgrade of Ubisoft’s multiplayer team-based looter-shooter, in just about every way. There are a two particular titles in early 2019 that I dearly want to “wow” me. The first is Bioware’s Anthem, whereas the second is Massive Entertainment’s The Division 2. While Hans certainly enjoyed the former, I must confess that I thoroughly preferred the latter. As a huge fan of The Division, I admit that it was not without its problems. Generally speaking, games of an online manner like The Division, Destiny, and even Warframe, suffer from network quality issues. Connectivity aside, end game content is often also an issue with these kinds of games. While Warframe is free-to-play, it has improved immensely in recent years, while Destiny received an amicable sequel, and The Division has had a number of expansions to improve the base experience. Given the popularity of the initial offering, a sequel to The Division was inevitable. 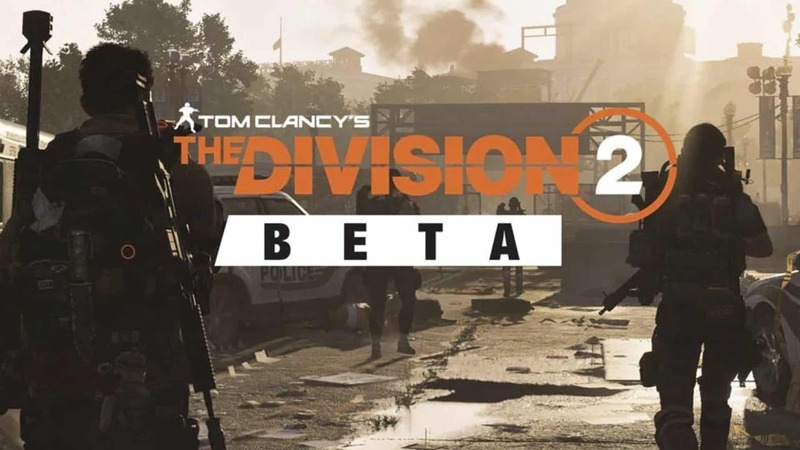 Thankfully we were lucky enough to receive code for the The Division 2 private beta. After many hours of playtime, I will tell you right now: The Division 2 is everything the original should have been, and much more. The first thing players will notice is that the game takes place in a whole new setting. 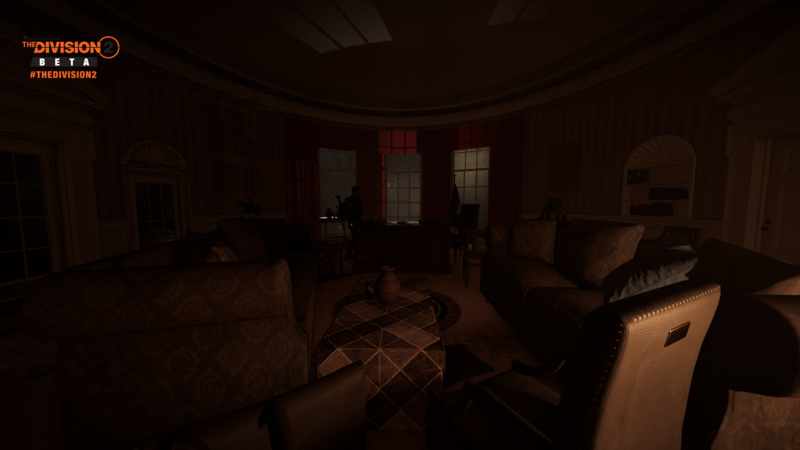 Right after the introductory cutscenes and minor tutorial, players will be thrust into an instanced area with a single mission: to help defend the White House. The Division 2 takes place sometime after the Outbreak, a catastrophic event that hit the country by storm and caused hundreds of thousands of fatalities. This outbreak was the result of a biochemical weapon that spread via touch during Black Friday. 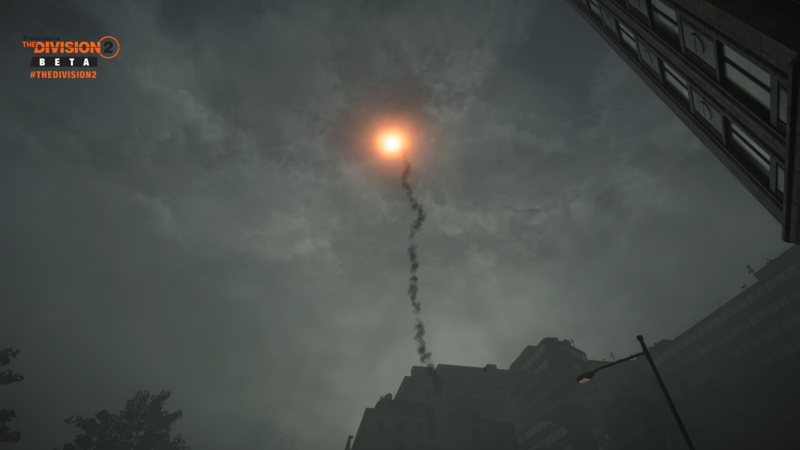 While it is still unknown whether The Division 2 is a sequel or just a new game in the franchise, the area of District Columbia has lots of stories to tell. 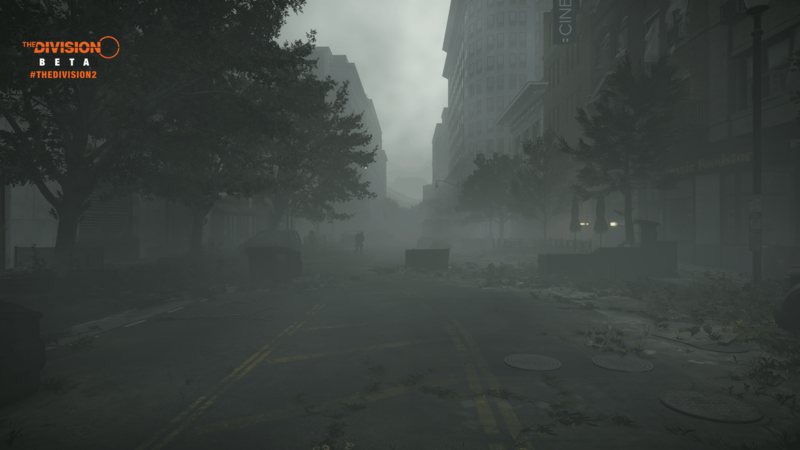 Gone are the snow-covered streets of New York and the empty and barren wastelands that are the dark zones of Manhattan. Division 2 presents players with a way better looking, lush and colourful Washington DC. Streets look like they have not been hit a by a nuke, and parks and gardens are slightly overgrown and untended; yet still beautiful in their own right. Similarly, buildings still look pristine and untouched by waves of rogue enemies, with the exception of rebelling groups and protesters here and there. Every district feels distinct, and while I have never been there in person, I have been told that certain key features of Washington have been reconstructed on a one-to-one ratio. The most important improvement, however, is the fact that Washington feels lived-in. There are actual people roaming the streets, not just one or two straggling “survivors”. I also have to note that the game looks incredible, even in its current beta state. While Washington DC is a marvel to look at, there is a noticeable difference in the way that the game is presented as a whole. The Division tried to make everything look as photo-realistic as possible. Chromatic aberration was used extensively throughout the game in order for things to look sharper and shinier than they normally would. Similarly, shadows and lighting played huge roles in conveying the atmosphere of buildings and certain scenarios. The Division 2 private beta seems to be a lot cleaner than the game before it. It is hard to explain, but the best comparison would be to look at how gritty Hitman Absolution was, versus the much cleaner look of the revived Hitman titles. Another great example of the aesthetic would be Dragon Age: Inquisition, where characters seemed solid, yet full of emotion, and not-at-all photorealistic. As far as Gameplay is concerned, The Division 2 private beta definitely delivered. I remember how The Division was highly criticised for its bullet-sponge enemies and repetitive nature. The good news is that this has been somewhat mitigated in the sequel. The Division is a role-playing game (RPG) in every sense of the word. Just like Destiny, it features enemies with health bars, bosses with loads of armour, and area of effect attacks (such as grenades) that prove effective with crowds. 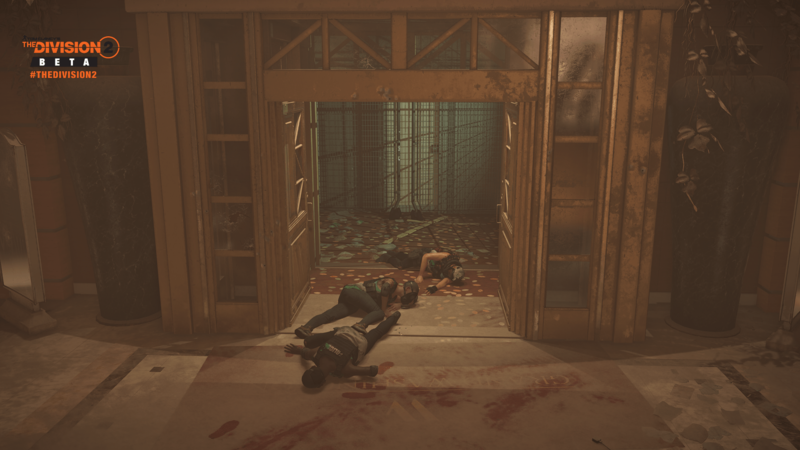 This kind of gameplay persists in The Division 2. However, where The Division 2 shines is in the fact that the development studio had years to fine-tune the experience. The things they learned and improved upon in all of The Division’s expansions are injected into the sequel with copious amounts of polish and love. The result being a wonderful looter-shooter where enemies are easy to take out, but adequately spongey when and where it makes sense for them to be. While this means that headshots are not really “fatal” shots (the way Ghost Recon: Wildlands does it), it also means that enemies pose threats in the same way they would in a myriad of multiplayer-centric games. That does not mean that you should discount headshots, however, as they still deal critical hits that take off huge chunks of enemy health. Similarly, enemies also feature “glowy bits”, which take the form of grenades hanging from belts, or unarmoured limbs, where players can also deal heavy damage. The same cover-based mechanics form The Division make a return when dealing with enemies. However, this time it is clear how much Ubisoft also enhanced the admittedly abysmal artificial intelligence featured in lower level foes. Low-level enemies are still extremely easy to take out in The Division 2 private beta, with questionable tactics employed across the board. However, as soon as lieutenants and captains enter the scene, firefights turn from easy experience fests to all-out gameplay that proves to be equally as rewarding as it is challenging. Unfortunately, a lot of character progression was locked in The Division 2 private beta. So I could not see the extent of what The Division 2 will have to offer at release. However, the game did tease quite a lot of the skill-based perk system that it now employs. This is a system that has been derived from the one used in the first title, whereby players unlock skill points every couple of levels. However, it does seem to have been improved and fine-tuned in order to offer a much cleaner and easier to understand interface. In the same vein, weapon upgrades have also been improved tenfold. In the past, players could loot weapon mods and attachments from dead enemies and caches dotted around the world. This time around, it seems to be tied to the perk system, as well as featuring only mildly as rare drops. While I could not experiment too much with this system, I did notice that weapon attachments unlocked via the perk system could be attached to most weapons, whereas looted attachments were weapon-type specific. With a nice new locale and some very complimentary gameplay, The Division 2 already appears to be a stronger title than the one that came before it. Every time I played, I could log in without any issues, and the game loaded fast, performed dutifully, and even delivered excellent open-world buffering without the need for textures to pop in and out. With that said, the biggest issue I had with The Division 2 private beta, or rather the aspect that is least improved, is the confusing stats system. Everything else, however, including gunplay, environmental design, enemy design, inventory management, progression systems, and much more, are improved upon and reworked in such a way, that the game feels like the franchise has received a breath of fresh air. Naturally, I cannot wait to get my hands on the final release.